The name The Spaniels elicits the image of late night smooches to the soundtrack of "Goodnight Sweetheart It's Time To Go"; there are few groups more legendary in 50's r&b/ doo wop, and the band was led by the incredible lead vocalist Pookie Hudson. Pookie has probably the sweetest singing voice I've ever heard, and the Spaniels records featured his voice to the greatest effect, cutting some of my favorite doo-wop cuts. The group (formed in Gary, IN and signed to Gary based VJ records) was an active recording unit (with a few lineup changes) up thru 1961, after which a few brilliant Pookie Hudson solo 45's were released. Almost as if via premonition of the doo wop revival the group reformed around 1969, coming back with this single. The flip side (which was the "a" was a remake of "Goodnight Sweetheart" which, frankly, pales next to the original. 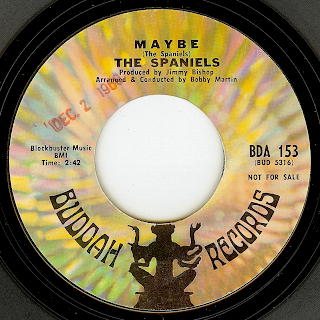 However, on the flip side the group hits their stride; thos gorgeous vocals were matched with a fantastic late 60's soul sound for the glorious "Maybe"; a very fitting addition to their brilliant legacy. Well I for 1 would like to hear the reamke of goodnight. Thanks as always.